Which of the three yellow golf balls is/are not lying out of bounds? Answer at end of point 8. I am often asked if I know of any tips or techniques that will help golfers to remember Rules of Golf, especially penalties. Here are a few suggestions that might help, but be warned that like most general aide-mémoires, there may be occasional exceptions that could catch you out. If a player accidentally causes a ball at rest to move (or is deemed to have caused it to move, as in Rule 18-2b) there is a penalty of one stroke and the ball must be replaced; if God moves the ball there is no penalty and the ball must be played from where He moved it to. A ball must always be marked before it is lifted if it is to be replaced at the same spot. Relief under Rule 26-1 (from water hazard) and Rule 28 (ball unplayable). As easy as A,B,C! Option a) As near as possible (to the previous spot). Option b) Behind (the reference point). Option c) Close (within two club-lengths of the reference point). One club-length is for ‘free’; two club-lengths are for a ‘cost’. Meaning that whenever you have a free drop under the Rules you drop within one club-length of the reference point, but if you are taking relief under penalty (e.g. ball unplayable, water hazard) you drop within two club-lengths of the reference point. (edit 19th March 2013: There is NO such thing as one club-length relief! The relief is within one club-length of the nearest point of relief). You always have the option, under penalty of one stroke, of playing a ball as nearly as possible at the spot from which you last played (Rule 27-1). Artificial objects (i.e. objects that have been changed by a manufacturing or construction process) are obstructions, whereas natural objects are loose impediments. CCOOS - Cut, cracked or out of shape. (Ball Unfit for Play, Rule 5-3). Remember the three times that you cannot clean the ball when you lift it I U I - identifying, unfit for play and interfering/assisting. Unplayable lie - 3 options, Disqualifications for failure to correct - 5 (holing out, wrong ball, wrong teeing ground, wrong place significant breach, and wrong order on foursome competition). Water hazards - yellow lines/stakes; lateral water hazards - red lines/stakes. A movable obstruction is movable without penalty anywhere in the universe. Paul offered this tip: Note that the number sequence “3-1-2-3” is a convenient way to remember the number of persons authorized by Rule 20 [Lifting, Dropping and Placing …] to take a ball out of play or put a ball into play. “3-1-2-3” relates to Lifting – Dropping – Placing – Replacing. 1 The penalty for a first offence of undue delay may be modified to one stroke in stroke play and loss of hole in match play by a condition of competition. 2 Rule 19-5a provides an exception where a penalty is incurred in stroke play, but not in match play, when a ball putted from the putting green is deflected or stopped by a ball at rest on the putting green. 3 In match play there is a penalty of one stroke for lifting an opponent’s ball, whereas in stroke play there is no penalty for lifting a fellow competitor’s ball. If you know of other aide-mémoires that help you remember Rules of Golf please let me know. Now I invite you to click on this link to view my indispensable resource for anyone who wishes to improve their knowledge and understanding of the Rules of Golf. Option a) Another ball (as near as possible to the previous spot). Option b) Back on line (keeping reference point between you and the flag). Option c) Club lengths (within two club-lengths of the reference point). Yes, that's probably even better than my a),b),c) in 4 above. I probably should have pointed out that the c) option only applies to lateral water hazards, not water hazards. Have you altered your original drawing of the three balls out of bounds. The B ball WAS touching the course originally, now it is not. Where does it state the ball is in bounds when it touches the course please. Well spotted! Yes, I did clarify the diagram; the middle ball was never outside of the white line, but it did appear that way in the low resolution on the web page, so I moved it over. When out of bounds is defined by a line on the ground, the line itself is out of bounds. 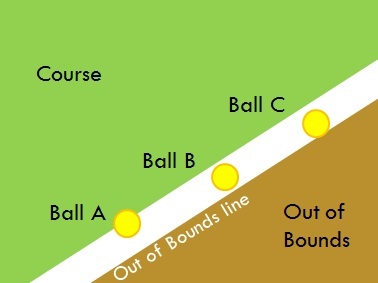 The out of bounds line extends vertically upwards and downwards. A ball is out of bounds when all of it lies out of bounds. Therefore if any part of a ball overhangs the course it is in bounds. Live in the desert and play a par 3 that you have to carry desert. The green is surrounded by yellow stakes and there is a drop area. What if your tee shot carries the hazard, lands in a green side bunker and then you hit your bunker shot back over the green and into the hazard? Where do you drop. I think back in the drop zone or re hit from the bunker? Can't find an answer anywhere! Whether you are able to drop in the dropping zone following the circumstances that you describe will depend on the wording of the course's Local Rule relating to the dropping zone. The player may certainly drop back in the bunker and play again under penalty of one stroke (Rule 26-1a). They may also drop a ball behind the water hazard, keeping the point at which the original ball last crossed the margin of the water hazard directly between the hole and the spot on which the ball is dropped, with no limit to how far behind the water hazard the ball may be dropped (Rule 26-1b). My short video on taking relief from water hazards at www.RhodesRulesSchool.com should help you understand this third option. Thanks for the answer. In this case the third option would not work because the side of the hazard the ball entered is cart path against a rock wall with a road on top. I am going to assume that because of this the drop circle is an option. You say, "I didn't even rest the club on the ground", which means that you did not ground your club and did not incur any penalty, if it was known or virtually certain that you did not cause your ball to move (hard to rule on this without witnessing the incident). If you had grounded your club (whereby the grass had been compressed to the point where it would support the weight of your club) then the ruling would depend on where you usually ground your club behind the ball. If it is customary for you to ground your club "a couple of inches behind the ball" to make the stroke that you were about to play from the rough, then you would have incurred a penalty under Rule 18-2b. However, if you purposely left the club further behind your ball than normal, then no penalty was incurred unless you caused your ball to move. This can of course be a subjective decision, which should be ruled against the player where there is doubt. I blogged on this subject on 13th April (http://www.barryrhodes.com/2012/04/addressing-ball-update-from-r-usga.html). You did not 'address' your ball, but you may still have incurred a penalty. When you touch grass with your club it can set-off a chain reaction of moving grasses alongside, a domino effect. This can lead to the ball moving, especially where gravity is also involved and the ball is resting on grass in rough rather than on the ground. If a player sees their ball move as soon as they lightly touch grasses behind it the likelihood is that they caused the ball to move; the penalty should be taken and the ball replaced. If the player is sure that their action did not cause their ball to move then they incur no penalty. To the right of a par 4 hole on our course is a length of deep scrub behind a low lying wall. on the fairway side of the wall are a line of trees. This scrub runs for the length of the last 180 yards of the hole and any loose shot to the right is lost in this scrub, rarely found and even more rarely played. This creates slow play as players hope the trees may have saved them and so search for balls before returning to hit again. In an effort to enhance the hole and speed up play, is it possible to mark this ground as a lateral water hazard? or what would be required to deem it environmentally sensitive? My recommendation for the remainder of this year is that players are encouraged to play a provisional ball when theyu hit a ball into this area., which does not meet the definition of either a lateral water hazard or an environmentally sensitive area. However, from 1st January 2019, the Committee can define it as a penalty area from which penalty relief is an option.